Happy Spring! While it’s definitely been feeling like spring for a few weeks now, it’s nice that is officially official. 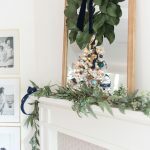 It’s that time of year again, when my blogger friends and I swing open our doors for a quick home tour of what decor we’ve got going on this season. The sweet, and completely lovely Marty from A Stroll Thru Life, rounds up the greatest group of bloggers and this spring is no different. Day 1 of the tour was AMAZING, if you missed it be sure to scroll to the bottom of this post to catch up. Okay, onto the tour! 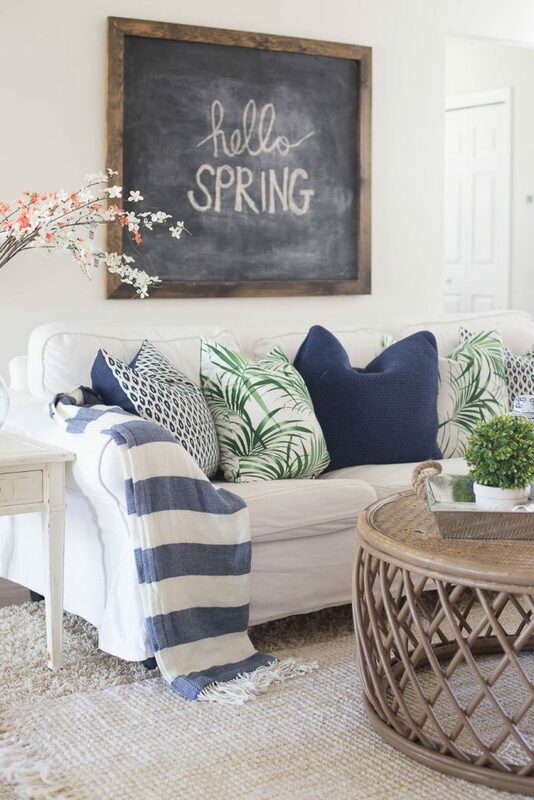 Today it’s all about spring decorating in the living room. 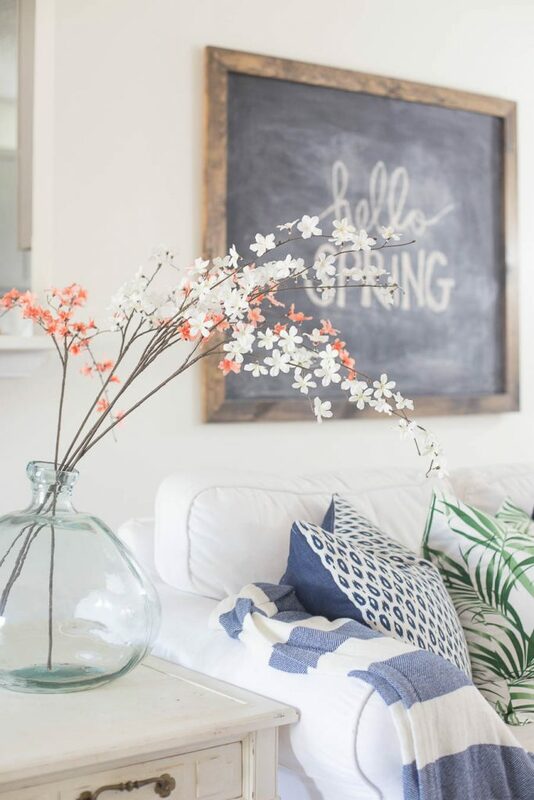 My spring decor is pretty much made up of lots of greenery + flowers (real and faux). 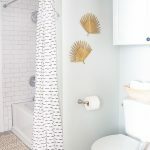 I find that it’s the best and frankly, easiest way to bring in the feel of freshness to my home. 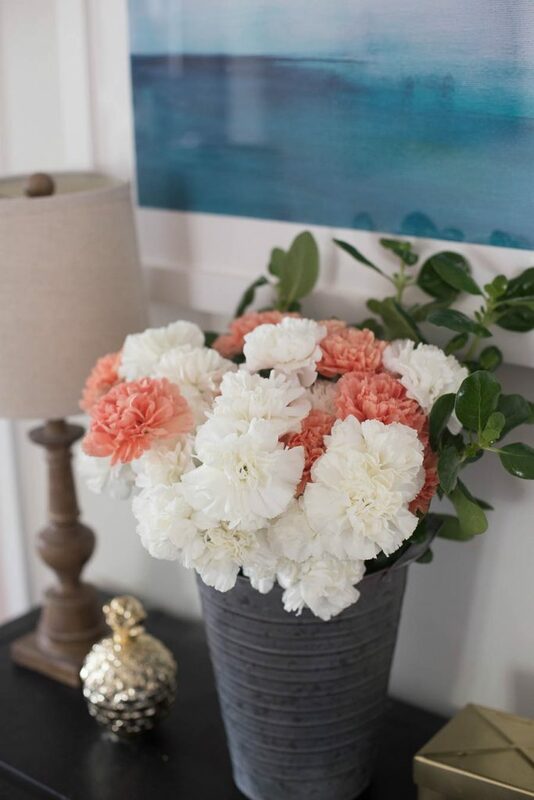 I typically overlook carnations when I’m looking for a fresh bunch of flowers but these were showstoppers at Whole Foods so I picked up a few bunches. I’m so glad I did because they last way longer than any other flowers I’ve purchased. My absolute favorite purchase this spring has been this throw blanket from Target. It comes in multiple colors but the navy one is my favorite (no surprise there). I know pastels are probably more “spring-ish” but I think the blues and greens give a natural look and are fresh for spring. I also added a pop of color with those wispy stems. What do you think? Are you a traditionalist and go with pastels for spring/Easter? I found this cute little bunny at Home Goods and I think he’s the perfect little spring mascot for our house. I’m still loving every bit of the gallery wall from earlier this year. It’s already a major focal point in this room so I didn’t add too much “stuff” over here as to not completely overwhelm the space. I did snag a few of these cute faux succulents from Target. They’re great for spring, or year round I say. 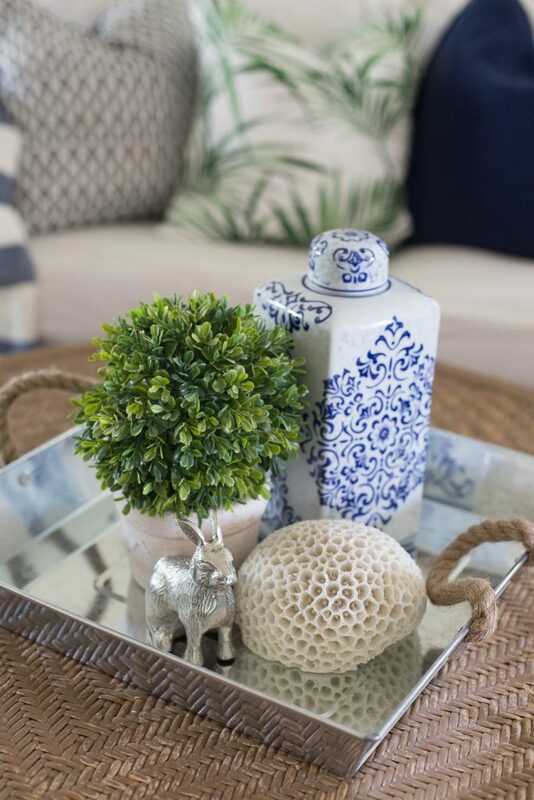 I also love to mix fresh greenery with faux for a more realistic looking arrangement. Here I mixed some greens from Whole Foods with a couple of faux stems. And you guys, I got a fiddle leaf fig! Well actually, I got a few (more to come on that later) but this little tiny is so beyond cute. Send us both good vibes that we can keep it alive! Alright ya’ll – thanks so much for stopping by. If you missed day 1 of the Spring Tour of Homes you’ll want to go back and check out all the gals from yesterday. Don’t forget the tour goes on all week so be sure to stop in each day to see who is up for day 3, 4, and 5! Such gorgeous colors that remind me of vacation and ocean. Your home is beautiful. I have the leaf pillows too and love them. Thanks so much, Julia! Those pillows were such a steal at HM, I had to get them! Gorgeous. I love all the greenery and flowers and the blue and green are perfect, so crisp and fresh. Those green leaf pllows are killer too. Thanks Marty! And thanks so much for organizing this tour – it’s so wonderful to see all this spring goodness! Your home is so beautiful Chelsea! I’ll take fresh green and blue over pastels any time! You’re so kind, Kris! THANK YOU! Chelsea, your home is gorgeous! I just came across your website because of the tour. Then I scrolled down and saw you were from Jax! I live in St. Aug and teach in PVB! Small world. Love your website because I am changing out my look this year. Tired of yellow and red! Moving to blues and grays. Thank you for all the wonderful ideas! So fresh and pretty Chelsea! 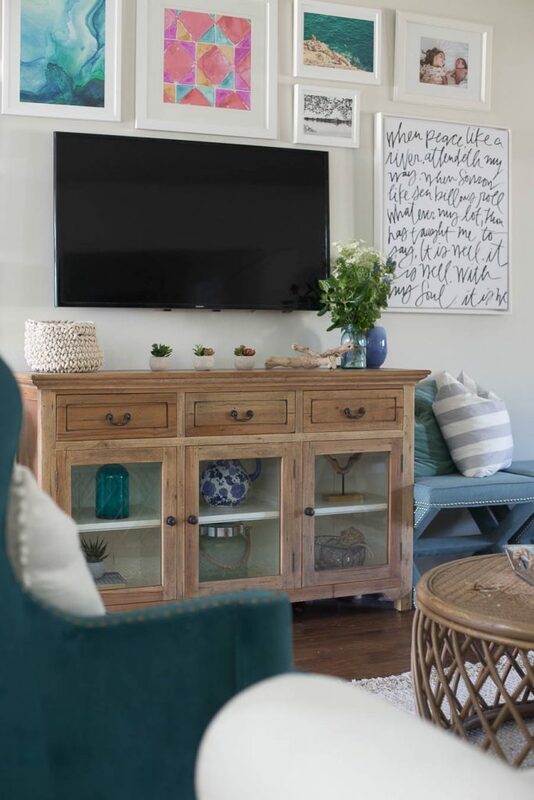 I love your fun chalkboard and gallery wall! So beautiful Chelsea! I see we both got the memo on navy and green for spring 😉 I totally need that throw, too. It’s perfection! Lovely! 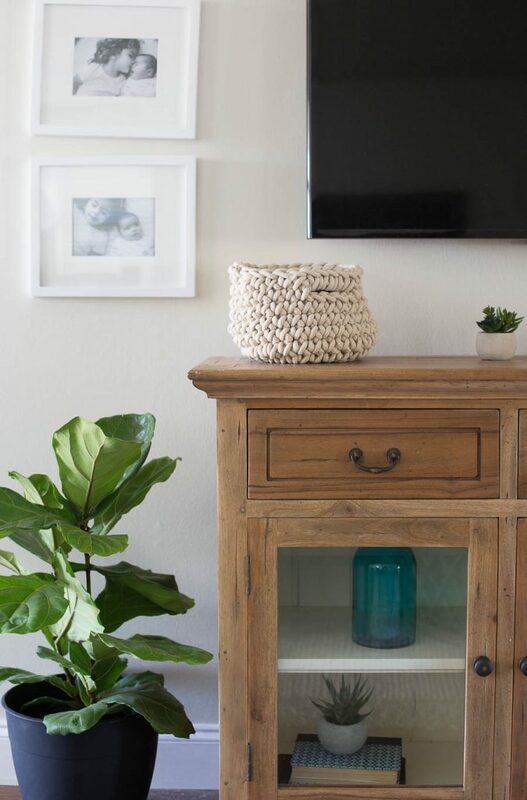 Can you tell me where you found your rattan coffee table? It is perfect! Hi Joy, the coffee table was a Craiglist find. Someone had it in their shed and wanted to part with it for just $25. Lucky find! Your colors are beautiful and relaxing. Do you the name & brand of the color on your walls? Beautiful!! Where did you find that coffee table? I’m in love with it! Hi Laura, it pains me every time someone asks because was a Craigslist find and I’ve never found one comparable! It really is great! 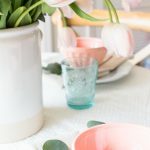 I’ve written an article on Spring styling for a small local online newswire in West Bridgford where I live and wondered if you would mind me using the ‘hello spring’ living room image off your blog? Beautiful home! Where did you find the green pillows with the leaves? I find it cool that you posted pictures of your living room after you decorated it just in time for spring. 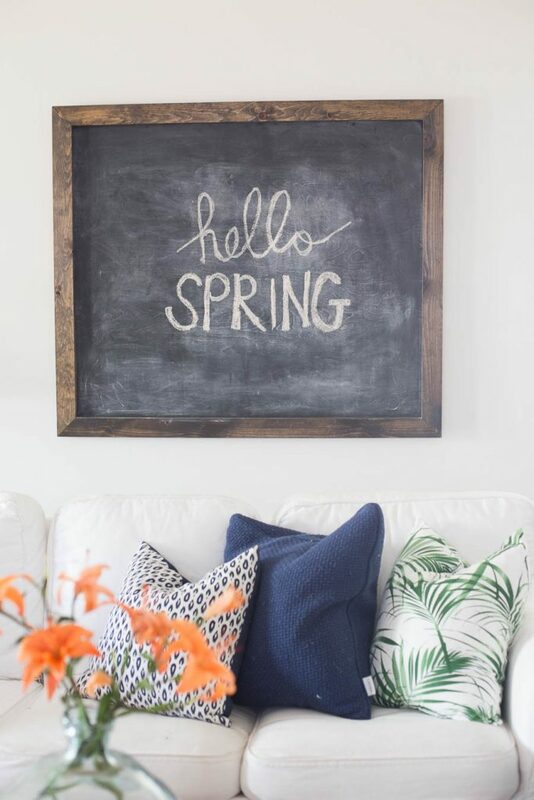 My favorite among your pieces is the huge chalkboard with “hello SPRING” written on it with a dark brown wooden frame. 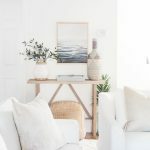 If I were to add something on your walls to fill it up, I would have ordered a canvas sign for you that says “BLOOM like a FLOWER.” Doing this will help complement the positive vibe you have around your home.